Summary: An ingeniously layered narrative, told over the course of one week, Eddie Joyce’s debut novel masterfully depicts an Italian-Irish American family on Staten Island and their complicated emotional history. Ten years after the loss of Bobby—the Amendola family’s youngest son—everyone is still struggling to recover from the firefighter’s unexpected death. Bobby’s mother, Gail; his widow, Tina; his older brothers Peter, the corporate lawyer, and Franky, the misfit; and his father, Michael, have all dealt with their grief in different ways. But as the family gathers together for Bobby Jr.’s birthday party, they must each find a way to accept a new man in Tina’s life while reconciling their feelings for their lost loved one. 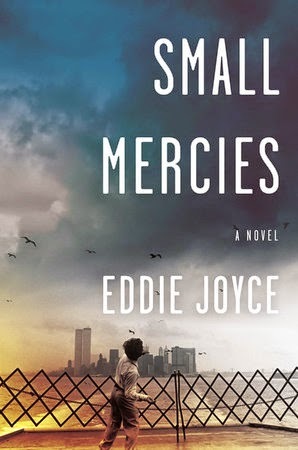 SMALL MERCIES is Eddie Joyce's debut novel and what a story it is! I absolutely loved this book and it will definitely go down as one of my favorites of the year. SMALL MERCIES encompassed everything I love about stories. This novel was beautifully written and had intriguing characters; however, it also managed to make me think and feel. SMALL MERCIES tells the story of the Amendolas, an Italian-American family living on Staten Island, and how they are trying to deal with the loss of their youngest son. Bobby Amendola was a firefighter who died ten years ago on 9/11. This novel explores the lasting effects his death has had on the entire family including his mother Gail, his father Michael, his brothers Peter and Frankie, and his wife Tina. By offering each family member's points of view, the reader is given a glimpse inside this flawed family to see how each person is not only coping with the loss of Bobby but also how they have moved forward and how they interact with each other. SMALL MERCIES is truly a gem of a novel. I was blown away by not only Mr. Joyce's powerful prose, but also his ability to bring these amazing characters to life. I immediately became swept up in the Amendola's lives, and I didn't want this novel to end... and that's a rare thing for me of late. Naturally, my heart went out to the parents, Gail and Michael, because what is worse that losing a child? And, I was also sick for Tina and her children. What actually surprised me about this novel is how realistically the author portrayed both the immediate and lasting effects of grief. I honestly don't know if I can remember reading a book that had a more honest look at loss; and as a result, this book touched me like few novels do. Another wonderful thing about SMALL MERCIES is how the author brought the setting of Staten Island to life. I would go so far as to say that Staten Island became another character in the story; and while I'm definitely not a New Yorker, I do believe that Mr. Joyce paid a lovely tribute to his hometown. Staten Island played a major role in the lives of these characters and it was closely tied to their identities. And finally, I loved how the author told this family's touching story. It might seem as if I covered this earlier; however, I want to stress how much I appreciated the little things he did in this novel that just brought it to the next level. For example, the different viewpoints throughout the story as well as the many flashbacks to the past worked extremely well in showing the complexities of the characters and how they relate to each other. Another example of his terrific storytelling was the pacing of the story. Specifically, how I could feel the tension escalate as Bobby Jr.'s birthday party approached. It was a time when the entire family would be coming together and trying to put aside their other issues. The party was also a time when Tina would introduce a new man in her life. While it was only one day in their lives, it was a huge event because it symbolized something bigger for these characters. They had to accept that Bobby was gone and at the same time accept that life does go on. It won't surprise you when I say that SMALL MERCIES would be a perfect book club selection. It truly is an honest story about love, loss and families that most readers will relate to. There is a reading guide available with twelve questions. Some of the themes that you might want to explore include grief, second chances, addiction, adultery, marriage, forgiveness, guilt, betrayal, memories, and redemption. I can't rave enough about SMALL MERCIES! Highly recommended! This sounds very moving. I'll have to look for it. Oh gosh. I have this on audio but haven't gotten to it yet. Sounds like I need to start listening.